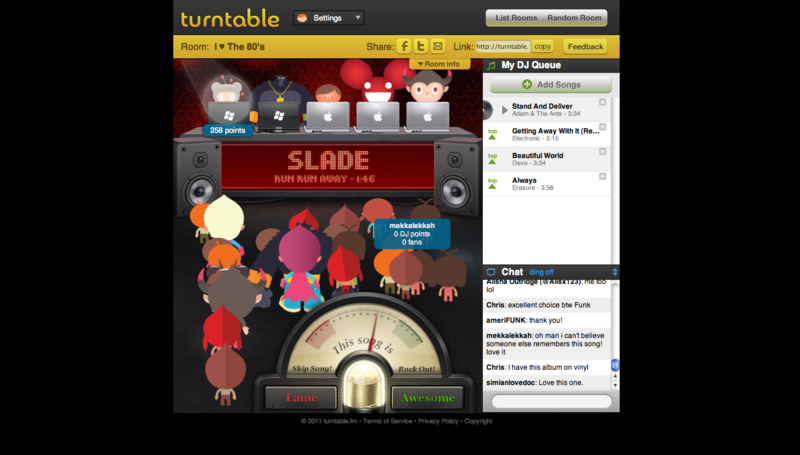 Have you crazy kids tried turntable.fm? It’s the latest music streaming website, but it’s interactive! The idea is that you and your friends are in a virtual club, and you can DJ music while your friend’s avatars bop their heads to the beat. Doesn’t that sound amazing? Doesn’t that sound like so much fun? I love to make playlists and I used to have one of “those” mp3 music blogs a few years ago. Sharing new music or just making a playlist is one of my favorite things, and I even consider it to be my superpower. Naturally, when I heard about this new website, I immediately joined and started exploring. I only joined a few days ago, and I’m already giving up on it. First of all, I should say that you can only join turntable.fm if you have a Facebook friend that is already a member. I’m sure anyone hip enough to read this blog is hip enough to get into the site. Am I right? Actually that is the problem with the site. Everyone who is a member is a snooty hipster and won’t let anyone else play. The only room that a newbie has a remote chance of DJing in is a room like “Play 3 and Step Down”, where there is an orderly queue of people waiting to DJ their 3 songs. Most of the time you have to wait for over an hour to get a chance to play songs, though. If you just want to stream your choice of songs, you can’t create your own room and play by yourself, because you have to have two DJ’s in order to hear anything besides a sample. If you can’t DJ, you can’t earn points and change your avatar to a Deadmau5 or other fun stuff. Also it’s just fun to DJ and see everyone enjoying the song, or to get a chat message that you made a cool choice. A DJ also can earn “fans” which is validation of uber-hipster coolness. Maybe it’s because I am not an aggressive person, but I can’t get in to a DJ booth to save my life. I am a very impatient person and I hate waiting around for someone to leave. I don’t have hours and hours to spend in the turntable rooms waiting for the unlikely moment that someone will step down and actually let me play some songs. In a moment of desperation, I made my own room tonight, and only one of my friends took pity on me and came in to listen. Either everyone who reads this blog needs to join turntable, and become my “fan” (DJ name: mekkalekkah), or I should just forget turntable.fm and move on with my life. I leave it to you, dear reader, to decide my fate. THIS IS SO IMPORTANT YOU GUYS. No, no, I’m just kidding – but I would like to know if anyone reading this post has used the site, and what their experiences have been. While I was writing this post, a bunch of people came into the room I created and now I feel all better. I’m still posting this though! So there. This entry was posted in Music, Opinions/Rants and tagged elitism, hipsters, hype machine used to be important, playlists, rants, social networking, streaming music, tech, turntablefm on July 7, 2011 by mekkalekkah. Google’s trying again to make a “Facebook killer”. Remember Google Buzz? Google Wave? Those attempts both failed miserably. Google’s ready to try a third time, and the third time’s the charm, right? Hmmm…maybe not. I was lucky enough to get a Google + Invite the day it launched. I sent invitations to some of my tech-savvy friends, but not all of them could get in. Google declared that it was “at capacity” and could allow more users at a later date. Obviously, Google is trying to raise some demand, but tactics like this are not wise when you’re trying to build a social network. Google + is a lot like Facebook, in that you can share your thoughts, photos and web links with your friends that use the service. However, if you only have six friends who were allowed into the service, then there isn’t much to look at. It’s like being in a huge auditorium and only the first row is full. Everything you say goes into an echo chamber and you feel more alone than ever. The main differences between Google + and Facebook is that you can compartmentalize everyone into groups (called Circles), such as Family, Friends, Acquaintances and any other category you can think of. It’s very user-friendly to create the groups, and it solves the problem of adding your mom to your friends list. Another exciting feature of Google + is the “hangout”, which allows users with webcams to create a group video chat. I haven’t used it yet, but it seems like a fun idea for someone like me, who has lots of friends scattered all over the globe. Other than those two things, it’s pretty much the same as Facebook. Instead of a “like” button, you have a “+1” button, which you click to show your appreciation of a post. Based on the few days I have been using Google +, I predict another failure on Google’s part. Trying to launch a social network based on the theory that it’s only for the “cool kids” who got invited is a minus, not a plus. A full public offering would have been best, although I know that’s what Google did with Buzz and that was a huge failure. However, Google + makes sure to show your privacy options up front. The problem with Buzz is that even if you didn’t want to use it, you were forced into it. Hey, Google, how’s about letting everyone try Google + if they want to? Don’t force everyone into it, but don’t make it an exclusive club for the elite either. This entry was posted in Opinions/Rants and tagged epic fail, facebook killer, google +, google buzz, google wave, social networking, tech on July 1, 2011 by mekkalekkah.